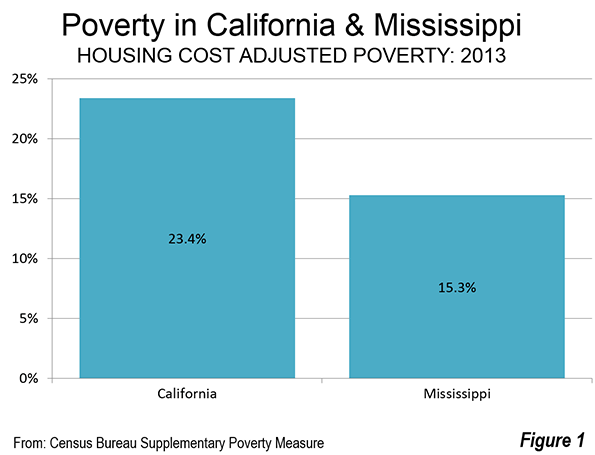 The Census Bureau’s Supplemental Poverty Measure (SPM) for 2017estimates that California’s poverty rate is at 19 percent. That figure is a slight 1.4 percent drop from last year, but still the highest of any state. The bureau’s methodology takes into account the cost of living in a given area. Caroline Danielson, the policy director at the Public Policy Institute of California, said a high cost of living, in particular for housing, had weighed the state down. “The state’s high housing costs have weighed heavily relative to many other states,” Danielson told The Hill via email Thursday. California’s high cost of housing has kept it around the top of the SPM since the Census Bureau began releasing data for it in 2011, according to Danielson. Still, the 1.4 percent drop is consistent with national trends which saw the poverty rate for the entire country drop from 12.7 percent last year to 12.3 percent. The whole country has been experiencing a drop in poverty rates for the last three years, according to federal data.